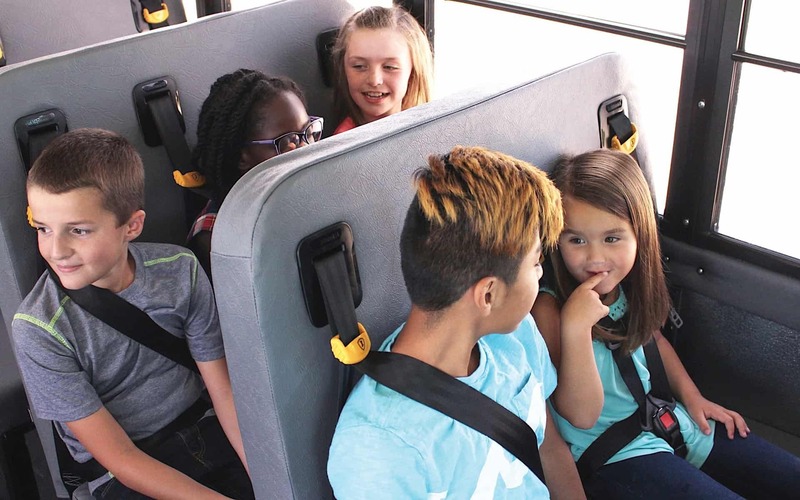 Not waiting for a federal or state mandate, several school districts are taking the initiative to add three-point seat belts to their school buses. The national conversation around seat belts on school buses, and specifically the lap/shoulder variety that is similar to the systems in passenger vehicles, has intensified in recent months, due to the fatal Paramus school bus field-trip crash in May, as well as a National Transportation Safety Board’s report released five days later. That report detailed causes of the two fatal November 2016 crashes in Baltimore and Chattanooga and recommended that states pass laws mandating seat belts on school buses. Some industry professionals are strongly supportive of this, and some are adamantly opposed. In some states, like New Jersey, legislation is already in motion. Federal legislation has also been introduced. Randolph Township Schools in New Jersey made its decision to begin implementing lap/shoulder belts into its school bus fleet as a direct result of the Paramus crash. New Jersey is one of the four states currently mandating two-point belts, the others being Florida, Louisiana and New York. However, Louisiana’s law requires legislative funding to require school districts implement the occupant restraints. The NTSB singled these four states out for a recommendation to upgrade their state mandates to require three-point belts. Meanwhile, California has required lap-shoulder seat belts on all school buses since 2005, with Texas passing a new law last year that requires the seat belts—unless a school district citing lack of funds holds a public school board meeting to opt out. Nevada also passed a state law last year with an implementation date of July 2019. Every year, Randolph Township orders four to five new buses, and the district plans to include lap/shoulder belts on all of its new bus purchases. This will cost $5,700 to $7,200 extra per bus, Eckert said. Its primary bus suppliers are Blue Bird and Van-Con. “We reacted pretty quickly,” said Eckert, to get the lap/shoulder belt-quipped buses ordered by the end of May. With about 50 buses in the fleet, they estimate that it will take 10 years to outfit them all. Meanwhile, officials at Fort Wayne Community Schools in Indiana kept track of bus crash incidents throughout the country, as well as state and federal attitudes on school bus seat belts. The district performed its research and decided to start the process. Jackson has 255 yellow buses in his fleet. For this school year, the district ordered 26 buses equipped with three-point belts. Jackson has a tentative count of about 30 more to purchase for next school year, but said that funding has yet to be solidified. The district has used buses for about 12 years, and does plan to add the lap/shoulder belts to each new bus purchased. FWCS is considering where the seat belt-equipped buses will be the most useful, and how to train both drivers and students in their use. “Any time we’re going to take a trip out-of-town on the highway, we want to use lap/shoulder belts. Obviously, at high rates of speed, there’s always that potential you could have an accident or a rollover,” he noted. “Other than that, we’re basically incorporating them onto our routes.” Long routes could also see more use of the seat belt buses, since students can have a hard time staying seated for stretches of time. The district anticipates that the belts will reduce negative student behavior and school bus driver distractions, thereby improving overall safety and uncovering benefits that can be realized, even if the school bus doesn’t get into a crash. Route times are also expected to improve, because drivers will not have to pull over and regain control of student behavior. Medical claims could even be decreased, because students will be kept in their seats and not be bumped around as much. “We’ve looked at this quite thoroughly,” Jackson agreed. He said he has been having conversations on seat belts with his technicians for the last five years. Additionally, news of bus crashes resulting in injuries or even fatalities has caused the district to revisit the topic. “We’ve concluded that is a safety feature we just really wanted to have, in case one of our buses found itself in that kind of situation. We want to make sure that we’ve done everything that we can to be as safe as possible, to prevent injuries or fatalities of our students,” he said. There are also awareness, training and implementation programs planned before the 26 lap/shoulder belt-equipped buses purchased in April hit the roads this fall. Seat belts will become part of the yearly driver training held in August, and training videos from IMMI, manufacturer of the SafeGuard lap-shoulder belt seats, will be used. Indiana requires evacuation training twice yearly, which will be practiced with the seat belts. Videos are also made available for parents to watch with their children. The district also has a plan for enforcement. Students must fasten their seat belts immediately upon boarding the school bus, and the driver must walk the aisles to ensure that they have done so. School officials present during loading and unloading will lend assistance if the driver requires it. Students that fail to comply with the seat belt policy will be written up, and such situations are handled through the principal and parent. Other schools in the Fort Wayne, Indiana area are taking similar proactive measures with seat belts on school buses. Local news outlet The Journal-Gazette reported that Northwest Allen County Schools approved $250,000 to retrofit 24 buses with lap/shoulder belts. East Allen County Schools students will be trained to use the seat belts that several district buses were equipped with. Also, Southwest Allen County Schools is updating its handbook with enforcement policies on the seven seat belt-equipped school buses going into use. A recent STN webinar featured Monica Coburn, who previously served as transportation director at three Indiana school districts and is currently student transportation manager at SafeGuard seating, sharing how she implemented lap/shoulder belts into two of her school bus fleets. Previous articleReplace, Refurbish or Retrofit Aging School Buses?